Redcap&Truss acted as exclusive financial advisor to the ownership of Big Stone Boring Ltd. (“Big Stone”) on its sale to Big Bore Directional Drilling Ltd. (“Big Bore”). Big Stone was founded in 2012 to provide specialized Directional Drilling services to the oil and gas industry. 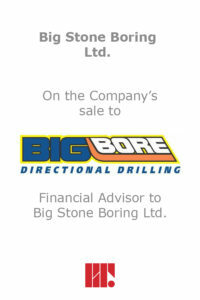 Based in Lloydminster, Alberta, Big Bore Directional Drilling was started in 2009. Big Bore primarily specializes in Directional Drilling, Boring, Trenchless Installation and Horizontal Drilling. “When we were having preliminary discussions with Big Bore, we had a general sense of what a fair deal would look like from a money perspective. The guys at Redcap&Truss confirmed our initial thinking, but also brought to the table some creative ideas on the other non-financial deal terms that we were not as familiar with. They did a great job in a short amount of time and negotiated a great deal for all sides .” – Michael Dorsett, shareholder of Big Stone Boring Ltd.